Historians may debate on when tea was introduced to North Africa (12th century by the Phoenicians or the 18th by the British), but there is no question that tea in central to Moroccan hospitality and tradition. 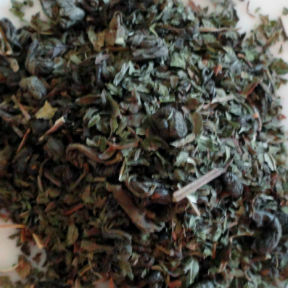 Mint is added to Gunpowder Green tea and enjoyed all day long, hot with lots of sugar. Lively and refreshing any time of day. This is a customer favorite, with or without sugar.